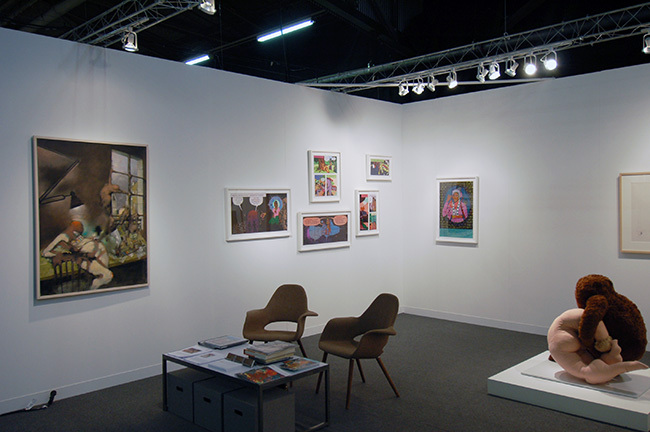 Gallery Wendi Norris will feature a booth that spans six decades by American artists Dorothea Tanning and Chitra Ganesh. The work presented collectively examines the female psyche, ranging from the domestic references of Dorothea Tanning’s soft sculptures from the 1970s to Chitra Ganesh’s mixed media drawings of luscious super-heroines. For Armory Focus, the gallery will install Tanning's soft sculptures, works that have been exclusively collected by and exhibited in major museums, as well as several of Tanning's drawings from her exhibition at the Centre Pompidou in 1974. These works contain anthropomorphic shapes, hybrid renderings of animal or material like objects. Ganesh’s works are contemporary, with a Greek and Hindu mythological undercurrent—another element that is commonly found in Tanning’s oeuvre. Ganesh’s bold use of materials (like Tanning’s for her time), include feathers, bullets, mirrors, to name a few. The overall installation will be airy, aiming to create dialogue between the two artists and foster creative discoveries about these artists both as individuals and, collectively, within the context of American art.